Jeffrey Adams concentrates his practice in the areas of business and tax planning, taxation, estate planning, probate administration, real estate, and employee benefits. Mr. Adams earned his Bachelor of Arts from Indiana University - Bloomington, IN in 1996. He attended Indiana University School of Law Indianapolis, earning his Juris Doctorate in 2000. He also earned his Master of Laws (LL.M.) in taxation from New York University School of Law in 2001. While in law school, he was a member of the Dean's Tutorial Society, as well as a member of the Indiana International & Comparative Law Review. His student Note, "Why Come to Training Camp Out of Shape When You Can Work Out in the Off-Season and Lower Your Taxes: The Taxation of Professional Athletes" is published in The Indiana International & Comparative Law Review, vol. 10,1999. 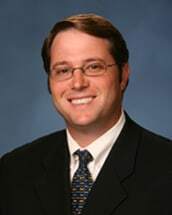 Mr. Adams joined Cohen, Garelick, & Glazier in June 2003, and is a member of the Indiana State Bar Association and the Indianapolis Bar Association. Student Note, "Why Come to Training Camp Out of Shape When You Can Work Out in the Off-Season and Lower Your Taxes: The Taxation of Professional Athletes, Indiana International & Comparative Law Review, Vol. 10,1999.